From the thrill of meeting a deadline to the horror of being scooped by a rival, to the sheer frustration of watching a lead go cold, co-writer/director Tom McCarthy depicts the highs and lows of the reporting profession with remarkable understanding. This is that rare film that appeals to both the head and the heart. In these cynical times, it’s comforting to be reminded of the power of solid, honest journalism. I’m going with four out of five. Nominated for 6 Oscars, Spotlight is my favorite of the 8 films nominated for Best Picture this year. Spotlight is pretty heavy on dialogue, completely essential though, as the movie is a no-nonsense retelling of a very serious subject and painstaking effort has gone into getting the details right. 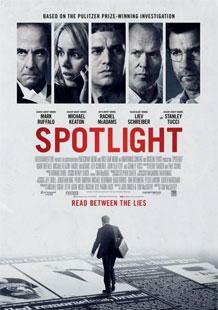 The real life investigation conducted by the team of Spotlight journalists won them a Pulitzer Prize. In case you do watch this movie – and it is highly recommended that you do – it’ll be easy to see why they won that honour. Bold, audacious and shocking, a consummate piece of work. In paying homage to that masterwork, Spotlight gains narrative heft but falls back on familiar footholds. It is a film destined to be this generation’s All The President’s Men instead of setting a Spotlight for other films to aspire toward. Yet this film shines for its determined eagerness to not shine.